The Ohio Light Opera, housed at the Freedlander Theatre on the campus of the College of Wooster, has been performing operettas and musicals for nearly three decades, specializing in the works of Gilbert & Sullivan, but branching out to many other composers over the years. They have had their successes and tragedies, but nearly always put on good shows for their loyal audiences. The opening performance of Miss Springtime, (Die Faschingsfee, or The Carnival Fairy,if you prefer the German title), Kálmán’s 1917 operetta of Carnival season intrigue in Munich was by my standards a rousing success. Everything about the work was done right. The singers were strong, the costuming and staging were excellent and creative, and the acting of the leading characters was appropriately dramatic or amusing, as it’s supposed to be. I have had my doubts for the last few years about performances at the OLO. The performances were good, but not great. They often lacked a certain spark, and sometimes the lead singers were sometimes a bit weak (except for the perennial Ted Christopher). However, the leads have become stronger with experience and that experience is now paying off excellent dividends. The plot is, as with most operettas, a series of mistaken identities, mishaps, and misunderstandings strung together into a loose sequence that can sometimes get one quite lost. Miss Springtime holds it together better than most. A Hungarian Princess (played by Tara Sperry) sneaks away to Carnival and falls in love with a painter (played by Grant Knox), despite the fact that she is betrothed to a German Duke in a marriage of diplomacy. The painter has been awarded a monetary prize by another Duke (played by Stephen Faulk), who shows up and lusts after the Princess. The painter loses his award, gets it back secretly by way of the Princess who cannot marry him, and... well it goes on from there with subplots involving other characters, and the eventual happy ending, with the Duke deciding that he can manage without dealing with a much younger wife who is in love with someone else. Three components hold this together as a splendid performance: the lead singers, the staging, and the music. Steven Byess conducts the OLO Orchestra in Kálmán’s delightful score, with English translation by Steven Daigle, the Director. Even in the years when I thought the singers were less than stellar, I have always enjoyed the orchestra, and this performance was as good as ever. Byess gets lots of applause from the regulars whenever his head pops up from the orchestra pit. The staging has also always been a key creative feature to OLO performances, and their use of simple but colorful sets, with the fascinating double duty of props from one act to the next is always a pleasure to see. I believe I heard an audible gasp from the audience when Act 2 began and the curtain went up. The stage and prop folks are exceedingly clever. But the singing is the centerpiece of every operetta, and this time out, the lead singers were a wonder to hear. Grant Knox is one of those singers who has been with the OLO for quite a few years, and his casting as Viktor Ronai, the painter, was an excellent choice. His voice is stronger than ever, piercing the theatre right to the back row, a clear, emotive tenor that commanded attention. Tara Sperry, the Princess, was also very fine, and her precise enunciation was a relief from previous soprano leads who tended to swallow their words. The “character” actors were also gems. Jacob Allen, as the hapless babysitter to the Princess, was in fine form as both singer and comedy actor. The real scene stealer was Stephen Faulk, as Count Mereditt, who needed to maintain a balance of lecherousness and humor, and did so with great skill. The rest of the cast also did a fine job, with excellent choral work and some good dancing (always necessary in operetta). The finale was a choral spectacular with the entire cast, and the audience was more than satisfied. If you haven’t been to the Ohio Light Opera, you really should go. There are still performances through August 11th, but hurry. The house was full for our matinee, and there may not be many tickets left. Try their other shows as well. I also saw Blossom Time, by Sigmund Romberg, and was just as impressed. But that’s another review. The O’Jays. We’ll Never Forget You: The Imperial Years, 1963-1966. Anyone who listened to the radio in the 1970s or 1980s knows the O’Jays. They were a prime exponent of the Philadelphia Sound, and one of the biggest R&B acts of the time. But before their first big hit, “Back Stabbers” (1972) and the later “Love Train,” they kicked around for more than a decade, honing their skills, going through name changes, personnel changes, and putting out records that occasionally cracked the Billboard Hot 100. And they weren’t from Philadelphia. It started instead in Canton, Ohio. There were lots of teenage vocal groups back in the mid-1950s in Northeast Ohio, and every big high school had several, including McKinley High in Canton. Most of them faded, but a group called the Triumphs came together there and didn’t disappear. The original members were Eddie Levert, Bobby Massey, Walter Williams, Bill Isles, and William Powell. Influenced by Frankie Lyman & the Teenagers, they began their career in the doo-wop style popular at the time. As musical tastes changed, they switched to a more soul/pop sound that occasionally reflected other groups such as the Drifters and the Temptations. They played local clubs, and eventually saw a lot of the “Chitlin’ Circuit,” the network of African American nightclubs where R&B acts of the era spent a lot of their time. 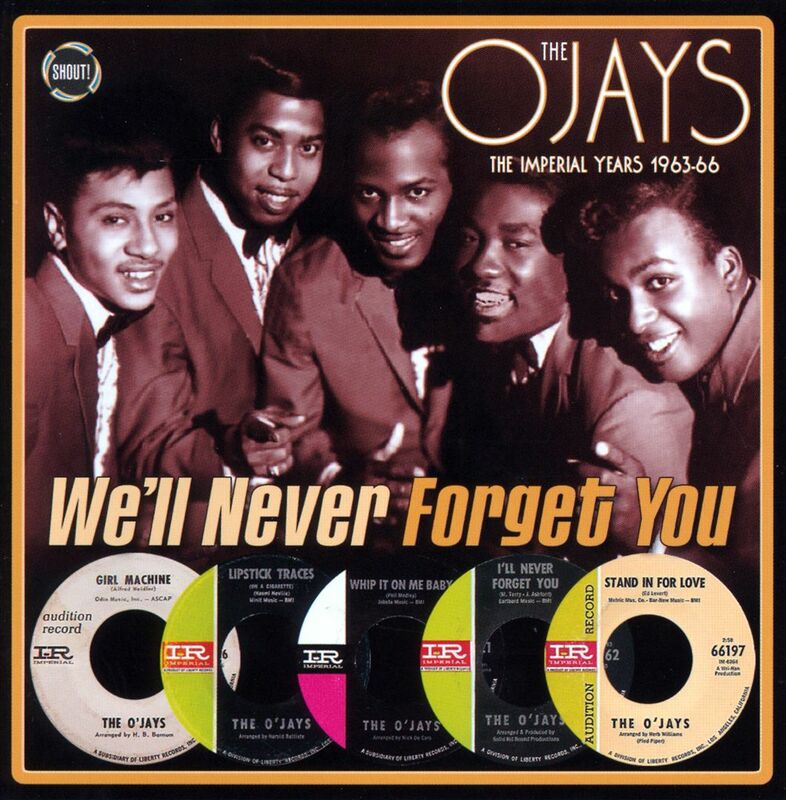 After changing their name to the Mascots, then to the O’Jays (after Cleveland radio DJ Eddie O’Jay) they bounced between a couple of record labels before landing at Imperial Records. There they began churning out singles in earnest, some placing well on the Billboard R&B charts. After 1966, they moved again, eventually ending up working with the team of Gamble and Huff, the masterminds behind the sound of Philly Soul. 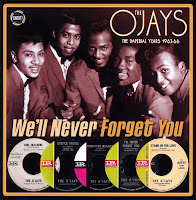 This CD presents nearly all their output for Imperial Records, A and B sides, and it shows an O’Jays that most people haven’t heard. Their sound, beginning with a re-release of their early doo-wop song, “Crack Up Laughing,” is like nothing they did in the 1970s, but has a sound that is solidly 60s, R&B heading for soul, with major elements of pop music thrown in. They sound great to these ears, but then I was a kid in that decade, glued to the radio and crazy about the music I heard. While I never heard one of these 28 tracks, they sound oddly familiar, fitting right in with the spirit of the times and feel like long lost friends I vaguely remember. It’s easy to hear the Temptations in their first charting single, “Lonely Drifter,” and later releases, such as “I’ll Never Forget You.” The Drifters are hanging in the air, ghostlike, in half the songs here. Other influences are less obvious, but they tried their hand at dance/pop music, New Orleans R&B, more bluesy material, and songs that make me think of the British Invasion years. While a lot of what they did was derivative, the music was done at a high level of professionalism, and they didn’t just imitate. One can hear something else developing over time, an identity forming. Production values on the remastered recordings are excellent. John Reed’s fine liner notes present the details of a group struggling to find itself and sometimes succeeding. Anyone who enjoys 60s soul and R&B is likely to find a great deal of interest. It’s all here, and it all sounds like summer, from 1963 to 1966. Tracks: Crack Up Laughing; How Does It Feel; Lonely Drifter; That’s Enough; Stand Tall; The Storm is Over; I’ll Never Stop Loving You; My Dearest Beloved; You’re on Top; Lovely Dee; Girl Machine; Oh, How You Hurt Me; Lipstick Traces (on a Cigarette); Think It Over, Baby; Whip It on Me Baby; I’ve Cried My Last Tear; You’re the One; Let It All Out; I’ll Never Let You Go; It Won’t Hurt; I’ll Never Forget You; Pretty Words; No Time for You; A Blowing Wind; Stand in for Love; Friday Night; I’m Gonna Make It; Time is on My Side. Once told me, “You got to play your hand. Welcome to Buzzard Tracks, a blog created by folks connected to Hiram College, and devoted to reviews of Northeast Ohio music, both recordings and concerts. At the moment, things are quiet here with summer upon us, but that is likely to change in a few weeks. I will be recruiting reviewers and writers, soliciting music, begging for money, and doing all the things one must do to get this project moving. The first review should show up by August. After that, who can say? Stay tuned, and we hope to surprise, enlighten, and stun you into submission.